When Dickens didn’t need to imagine, in order to construct the fiction he wanted, he didn’t. He recorded and adapted. He was a prolific recorder of topography in particular—of rooms, buildings, streets, quarters, towns, cities, landscapes. Great Expectations, more perhaps than any other Dickens novel, is characterised by a pervasive recording of place. It has two principal settings. There is the 'marsh country' in which the central character, Pip, is brought up, together with the 'nearest town'. And there is London—to which we may add Richmond, not formally part of London until 1965, but treated by Dickens as part of the metropolitan milieu. 'Great Expectations' was first published as a weekly serial. Leaving Chatham and Rochester for London, his father’s next posting, was indeed a blow for the ten-year-old Dickens. Forster declares that his earliest impressions of London were of 'his father’s money involvements.' They were impressions swiftly reinforced by his being put to work as a little 'labouring hind' at Warren’s Blacking Warehouse, and by his father’s imprisonment for debt in the Marshalsea Jail. 'God made the country, and man made the town,' said the poet Cowper. Given his life story, it’s scarcely surprising that Dickens too was tempted to see the country as a kind of paradise, out of which only the unlucky or undeserving were cast. Nicholas Nickleby, as the novel ends, needs to turn his back on the city to which misfortune has transposed him, and get back to his father's Devonshire acres (Nicholas Nickleby, 1838–39). 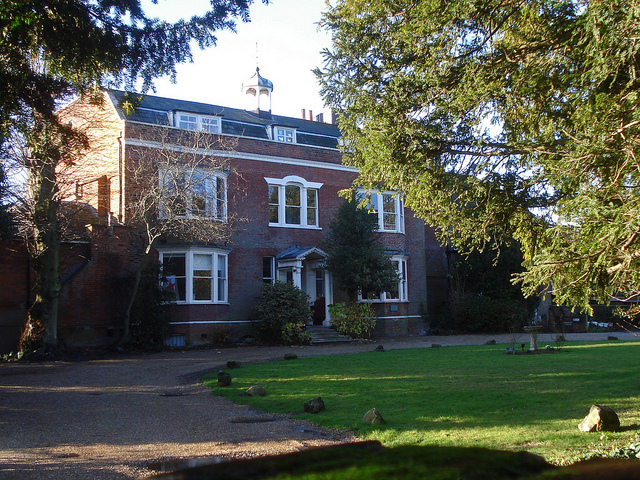 His purchase of Gad’s Hill Place in the Kent countryside, in 1856, signalled no retreat, then, from London to a childhood paradise. Dickens would soon become a commuter, travelling by train back and forth between London and Gad’s Hill, sometimes daily, sometimes at longer intervals. He had an apartment in Covent Garden over the offices of All the Year Round, the weekly periodical he edited from 1859, and stayed there for days on end. He spent time in Peckham, at the home of the young woman he loved, Ellen Ternan. During the London seasons, he rented houses near Hyde Park. In his personal life, and I suggest in his imaginative life too, Dickens was balancing London and the country. Especially after he and his wife separated in 1858, Dickens’s sense of human destiny began to change. By 1860, he was beginning to abandon his biographically explicable interest in little victims denied a country paradise, and to look for the roots of evil and suffering in personal choice. Oliver Twist triumphs through innocence (Oliver Twist, 1837–39). Pip has to face his own errors, to recognise that he has acquired ambitions more like his sister’s and Uncle Pumblechook’s, than those of Joe whom he loves. Smithfield derives its character from the institutions it accommodates. It was outside the walls of the Norman city, and thus used for institutions not suited to the crowded centre: for a cattle market, a couple of gaols, a monastery, and a hospital. Until Tudor times political and religious dissidents were put to death there, it was used for the pillory well into the eighteenth century, and in 1873 the public hanging of felons was transferred from Tyburn to Newgate, just by Smithfield. The monastery was dissolved by Henry VIII, but the other institutions survived into Dickens’s time. The beast market and the jail both remained places of coercion and death. Nobody is flustered and aggravated. Nobody is savage. In the midst of the country blue frocks and red handkerchiefs, and the butchers’ coats, shaggy, furry, and hairy: of calf-skin, cow-skin, horse-skin, and bear-skin: towers a cocked-hat and a blue cloak. Slavery! For our Police wear great-coats and glazed hats. In 1852 the Smithfield Market Removal Act was passed, transferring the beast market to Islington. Licensing controls were introduced on slaughterhouses at the same time, thus effectively moving slaughtering to Islington too. From 1855, no more live beasts were sold at Smithfield so, when he was writing Great Expectations, Dickens would have been looking back on the old beast market as a thing of the past. But the novel is set early in the century, before the market closed, and Pip’s repugnance echoes Dickens’s. Newgate Prison, adjoining the Old Bailey. It was demolished in 1902. Courtesy of www.peterberthoud.co.uk. While I looked about me here, an exceedingly dirty and partially drunk minister of justice asked me if I would like to step in and hear a trial or so: informing me that he could give me a front place for half-a-crown, whence I should command a full view of the Lord Chief Justice in his wig and robes—mentioning that awful personage like a wax-work, and presently offering him at the reduced price of eighteenpence. he was so good as to take me into a yard and show me where the gallows was kept, and also where people were publicly whipped, and then he showed me the Debtors’ Door, out of which culprits came to be hanged; heightening the interest of that dreadful portal by giving me to understand that “four on ‘em” would come out at that door the day after tomorrow at eight in the morning to be killed in a row. This was horrible, and gave me a sickening idea of London: the more so as the Lord Chief Justice’s proprietor wore (from his hat down to his boots and up to his pocket-handkerchief inclusive) mildewed clothes, which had evidently not belonged to him originally, and which, I took it into my head, he had bought cheap off the executioner. Under these circumstances I thought myself well rid of him for a shilling. The occasion is a grim foreshadowing of the trial of Magwitch, which takes place in the Old Bailey court. The city gate known as Newgate, at the western end of Newgate Street, between Old Bailey and Giltspur Street, existed in Roman times. It was rebuilt in the reign of Henry I, and used as a prison from 1188 or earlier. Rebuilt several times thereafter, the building featured in Great Expectations was constructed in 1783. Condemned felons were publicly hanged outside it throughout most of Dickens’s lifetime. It was only in 1902 that the prison was finally demolished. Dickens was perpetually concerned with prisons, and there can be little doubt this had to do with his father’s imprisonment for debt in the Marshalsea. Newgate, for him, was the chief of prisons, an institution to which his imagination returned again and again. Perhaps it was what sent his father to prison that made him dwell on the fact that, even though none had been confined there since 1815, the door through which prisoners were led for execution was known as the Debtors’ Door. Mr Jaggers’s office is in 'a gloomy street' named Little Britain, which meanders around and through the market and the adjacent precinct of St Bartholomew’s Hospital. The name of the street probably has to do with an expatriate Breton community once settled there, but Dickens allowed it to take on additional meaning. In the novel, the place is seen as the heart of a nationwide malaise, signified by the cycle of crime and punishment. Pip declares Mr Jaggers’s room to be 'lighted by a skylight only and a most dismal place; the skylight eccentrically patched like a broken head, and the distorted adjoining houses looking as if they had twisted themselves to peep down at me through it.' Here he is shown the death-masks of executed clients. Pip’s first home in London is in Barnard’s Inn, one of the ancient Inns of Chancery. The Inns of Court, great law schools and legal fraternities of London, eventually acquired the exclusive right of calling students to the bar, but the Inns of Chancery too were once law schools. From the seventeenth century, however, they gradually abandoned their educational role, evolving into societies, dining clubs and residences for attorneys and solicitors. Eventually they lost all formal connection with the law and, though still favoured by lawyers, began to provide accommodation for all-comers. Barnard’s Inn is on the south side of Holborn, opposite Furnival’s Inn where, as a young man, Dickens had lived for two years. In about 1453, the site of Barnard’s Inn was leased by one Lyonel Barnard, hence the name. It first became an Inn of Chancery in 1545. Its last Principal took office in 1728, and soon afterwards the property passed to the Skinners’ Company, which occupied it until 1892. The hall probably dated originally from the early sixteenth century. In Dickens’s time there were contemporary gabled buildings on the south side. The buildings on the north side, closest to Holborn, dated from the 1770s and 1780s. It’s in one of these that Dickens evidently placed Pip’s chambers. I supposed that establishment to be an hotel kept by Mr. Barnard, to which the Blue Boar in our town was a mere public-house. Whereas I now found Barnard to be a disembodied spirit or a fiction, and his Inn the dingiest collection of shabby buildings ever squeezed together in a rank corner as a club for tom-cats. Mr Jaggers’s home, as distinct from his office, is in Soho. In 1631, on what’s now the north side of Leicester Square, the second Earl of Leicester began to build a grand mansion which, by the mid-eighteenth century had become the residence of successive Princes of Wales. On the south side of Soho Square, a house was built for the Duke of Monmouth, Charles II’s illegitimate son. In emulation of this grandeur, many elegant houses were constructed in the district, which was considered very smart for most of the eighteenth century. But by the end of it Soho was beginning to fall out of fashion. Significantly, the two greatest mansions of Soho were demolished towards the end of the century: Monmouth House in 1773, and Leicester House in 1791. The eminent, rich and fashionable were leaving the narrow Stuart streets and little squares to the middle classes, to tradesmen, Bohemians, eccentrics, and the poor. Dickens had friends living in Soho: William Telbin (1813–73) the stage designer, for instance, and Gilbert à Beckett (1837–91) the playwright. He knew the grand seventeenth and early eighteenth-century interiors of Soho. Soho homes are often featured in the novels. Ralph Nickleby has one, and Dr Manette in A Tale of Two Cities (1859). Dickens was fascinated by the old-fashioned suites of interconnecting rooms, and the baroque ornamentation. the upper part of the house of a worthy gentleman then recently deceased, a bookseller named Manson, father to the partner in the celebrated firm of Christie and Manson, whose widow at the time carried on the business. Attracted by the look of the lad as he went upstairs, these good people lent him books to amuse him; among them Miss Porter’s Scottish Chiefs, Holbein’s Dance of Death, and George Colman’s Broad Grins. The latter seized his fancy very much; and he was so impressed by its description of Covent-garden, in the piece called the Elder-brother, that he stole down to the market by himself to compare it with this book. He remembered, as he said in telling me this, snuffing up the flavour of the faded cabbage-leaves as if it were the very breath of comic fiction. . . .
to Gerrard-street, Soho, to a house on the south side of that street, rather a stately house of its kind, but dolefully in want of painting, and with dirty windows. He took out his key and opened the door, and we all went into a stone hall, bare, gloomy, and little used. So, up a dark brown staircase into a series of three dark brown rooms on the first floor. There were carved garlands on the panelled walls, and as he stood among them giving us welcome, I know what kind of loops I thought they looked like. Dinner was laid in the best of these rooms; the second was his dressing-room; the third his bedroom. He told us that he held the whole house, but rarely used more of it than we saw. The table was comfortably laid—no silver in the service, of course—and at the side of his chair was a capacious dumb-waiter, with a variety of bottles and decanters on it, and four dishes of fruit for dessert. I noticed throughout, that he kept everything under his own hand, and distributed everything himself. The Soho of Great Expectations features the run-down splendour of a former age, made on this occasion menacing and unhomely. Pip's final London residence is in the Temple, a complex of buildings between the Thames and Fleet Street, housing two of the Inns of Court I’ve spoken of, the Inner Temple and the Middle Temple. For a significant part of his writing career, Dickens was a member of the Middle Temple. He first resolved to be called to the bar in 1834, was admitted to the Middle Temple as a student in 1839, was still intending to be called in 1846, and petitioned to withdraw only in 1855. He would have known that persons other than lawyers could become tenants of legal chambers. Buildings in the Inns of Court were often erected or refurbished at the expense of members proposing to occupy them. In return, they were granted long leases on favourable terms, which they were able to assign to whomever they chose. Pip’s chambers are in Garden Court—in the building that preceded the late Victorian one standing today—at 'the top of the last house . . . down by the river.' It’s a mark of the topographical precision of Dickens’s imagination that he took friends to see the actual chambers where, in his mind’s eye, Pip had lived. Estella, Miss Havisham’s adopted child, whom Pip vainly loves, finishes her education in Richmond, in the early nineteenth century a thriving little town, ten miles from London, fringed by the Thames at its most beautiful, and by a Royal Park. Its beauty had long made it a favourite retreat for Londoners, from royalty downwards. Edward I built a palace in Richmond, and there continued to be a royal residence on that spot into Stuart times. The Hanoverians favoured the area, too. All of them had residences in Richmond or neighbouring Kew. William IV, when Duke of Clarence, lived with his mistress at Petersham Lodge on the outskirts of Richmond, from 1790 to 1795. But by the 1830s, Richmond's character was changing. In an 1856 Household Words article, Dickens speaks of 'the respectability of Richmond Hill.' The Duke of Clarence was the last of the royals to live there. The arrival of the railway in the late 1840s drove away the nobility, too, unwilling to contemplate life in a suburb. Richmond was losing its rackety aristocratic character, and becoming more middle-class—just the place where it might be supposed Estella could meet the right people. A lingering aristocratic hauteur, infiltrated by middle-class morality, gave it a reassuring social tone. new and thicker ropes have been put up in the tree, the little birds have flown, their very nests have disappeared, the roads about are jewelled after dusk by glow-worms, the leaves are all out and the flowers too, swimming feats from Petersham to Richmond Bridge have been achieved before breakfast, I myself have risen at 6 and plunged head foremost into the water to the astonishment and admiration of all beholders, a series of performances have been invented for the swing which out-Blackmore Mr. Blackmore [ a trapeze artist]. You haven’t a notion of the glories we have been working, which to be appreciated must be seen. He also made regular excursions to Richmond, walking, riding or, eventually, taking the train. It was close enough to London to visit just for a dinner party at the Star and Garter Hotel, where Dickens celebrated birthdays, the completion of novels—any auspicious occasion. a widow, with one daughter several years older than Estella. The mother looked young and the daughter looked old; the mother's complexion was pink, and the daughter's was yellow; the mother set up for frivolity, the daughter for theology. They were in what is called a good position, and visited, and were visited by, numbers of people. There is one London zone, not immune to Dickens’s irony to be sure, but about which his attitude seems wholly positive. He places Wemmick’s house in the south London suburb of Walworth, which he describes as 'a collection of black lanes, ditches, and little gardens.' An 1819 Ordnance Survey map substantiates this. It shows terraces towards central London, but also plenty of open land, with ditches running through fields, and small detached cottages standing in their own gardens. In 1819, Walworth was evidently still pretty rural, and it remained so for much of Dickens’s life. Writing in 1853, Harriet Beecher Stowe called Walworth 'a charming retreat,' and described the sheep and lambs she could see grazing from her window there. Only when we turn to the 1871 Ordnance Survey map do we find Walworth covered with housing. Great Expectations repudiates the myth of the country paradise, repudiates the myth of fame and fortune to be picked up on the streets of London. It speaks to us instead of lost innocence, recoverable if at all only with difficulty. Dickens’s sense of topography, especially of London topography, graphically conveys this sense. David Parker was, at the time of writing, an Honorary Research Fellow at Kingston University, and for more than twenty years was Curator of London's Charles Dickens Museum. His most recent book is Christmas and Charles Dickens (New York, 2005). Sadly, David died in February 2013 - and was deservedly the subject of a substantial obituary in the Daily Telegraph.